Jaisalmer is a land of wonders, replete with an exuberant past, culture, natural surroundings and a rich heritage. It is one of the most popular tourist destinations that provide a unique experience to travelers. It is also known as “The Golden City” that stands on a ridge of yellowish sandstone and is crowned by the mighty Jaisalmer Fort. Every corner of this city has something to boast of and amaze travelers. Even the colorful turbans worn by the local menfolk have a unique character that makes you feel like you have gone back in time. The city was founded in the 12th Century by Maharaj Rawal Jaisal who later established his kingdom in the same place. 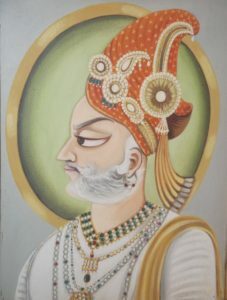 Jaisalmer is named after Maharaj Rawal Jaisal. Later, he built the Jaisalmer Fort on the Trikuta Hill which has now become one of the most popular heritage sites. The fort walls guarded the entire city until Ala-ud-Din Khilji attacked and captured it in the 13th century and managed to hold it for nine years. Jaisalmer played a major role as the gateway to Persian countries, encouraging a flourishing trade during medieval times. A visit to the Jaisalmer Fort provides one with an unforgettable experience. The fort is one of the largest desert living forts of the world and the second oldest fort in Rajasthan. It is a UNESCO World Heritage Site. The fort is also known as Sonar Quila or the Golden Fort as it is made of yellow sandstone. The fort offers accommodation options as well, within its mighty walls. Popular attractions like the Raj Palace, Jain temples, Laxminath Temple and the four gateways – Ganesh Pol, Suraj Pol, Bhoot Pol and the Hawa Pol, are located within the fort. 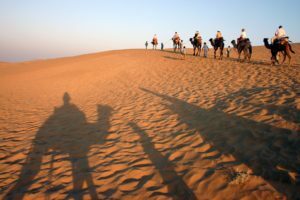 The Thar Desert is the world’s ninth largest tropical desert.The word ‘thul’ is the source of the desert’s name, the Thar. It covers more than 200,000 km of land and forms a natural boundary between India and Pakistan. The Thar Desert in Jaisalmer plays a significant role in tourism, attracting tourists from all around the world. Here, you can also enjoy the experience of desert camping, camel safari, and desert ecosystems. There is an abandoned village named Kuldhara about 15 km away from Jaisalmer. Prosperous clan of Paliwal Brahmins established this village in the 13th Century. Their trading skills and agricultural knowledge were quite famous. But one night all the villagers of Kuldhara vanished into the dark without any trace. It is also believed that they cast a curse over the village, whereby anyone who tried to live on their land would die. 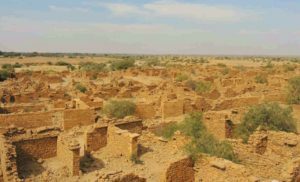 Today, it has become one of the popular tourist spots where tourists get to explore the mystery behind the ruins of the Kuldhara village. Recently, the government is investing to redevelop this place. 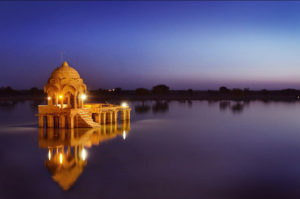 This lake was built near the Jaisalmer Fort in 1367. It is the only source of water for the desert city in earlier times. A beautiful yellow sandstone carved gate is located on the banks of the lake. Tilon’s Gate has a unique history attached to it. Gadi Sagar will transport you to a different world with its pleasant and silent atmosphere. You can also find migratory birds that stop by to drink from the Gadi Sagar lake. Discover how this city transformed from a thriving trade center into a popular tourist attraction where generations continue to live. The best time to visit Jaisalmer is from October to March, just before it gets too hot! So what are you waiting for? Put on your travel shoes and get ready to jump on board with EdTerra to explore a city filled with mystery and folklore, the Golden City of Jaisalmer. EdTerra Edventures conducts various international and domestic programs for the youth. If you go to school and are under 17 years of age, ask your school to contact us to arrange a visit to your school for an introduction to the “Jaisalmer” program and other journeys under EdTerra’s Indian Discovery Programs.